Yes, I admit it. I win the prize for stubborn bull-headed stupidity. This past Monday I saw patients all day while suffering from acute appendicitis. At about 3:30 in the afternoon my pain was bad enough that I knew I couldn’t continue working. I knew something was seriously wrong. My partner was kind enough to agree to see my last 2 patients for me, and I drove myself a few miles down the road to the ER. 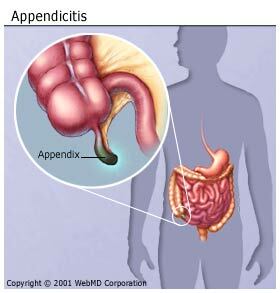 I’ve learned a few things about appendicitis from this adventure, which I’d like to share. I went from only minor not-feeling-well to seriously sick with 8/10 pain in about 8 hours. In school they taught us to be very suspicious of rapidly progressing abdominal pain, but it still was a shock at how quickly the illness can get bad. My pain was not around my belly button or in the right lower quadrant like I would expect. It was in my upper abdomen under my breastbone. In fact, having had gallstones many years ago I felt the pain was very similar to gallstone pain. I was surprised that my appetite stayed normal throughout most of the process. I had breakfast and lunch as I normally would have done. In fact, I had a snack mid-morning and it seemed to help the pain a little (so of course I diagnosed myself with an ulcer and started eating antacids). Nope, not really, and nope. Leave it to me to have everybody scratching their heads. The textbooks describe appendicitis as rapidly progressive pain around the belly button that moves to the right lower quadrant, with associated fever, nausea/vomiting, diarrhea and loss of appetite. My CT scan showed my appendix was enlarged but didn’t really look inflamed. Dr. Brown (shout out to my magnificent doctor and friend!) found I was tender when she pressed on my right lower abdomen and recommended we go ahead and take it out. I am so grateful to everyone who took such wonderful care of me at the new UH Broadview Heights ER and at my home hospital, UH Parma Medical Center. Dr. White at the ER was caring, reassuring, professional and thorough in dealing with a fellow physician who was in severe pain, frightened and mildly hysterical. The nurses and aides were gentle and compassionate. The OR staff made everything seem so routine and even joked with me a little (“We’re just waiting on your pregnancy test. Anything you want to tell us?”). And of course my rockstar surgeon Dr. Trudi Brown fixed me right up and made me feel so comfortable with the plan. She even mothered me a little, telling me I couldn’t go back to work right away, Being a doctor herself she probably could see the signs a mile away that I needed to be told to take care of myself! I’m feeling great and if I didn’t have a scheduled week of vacation coming up I’d be back to work Monday. As it is, I’m going to take advantage of the opportunity to relax and get some more rest. See you soon! 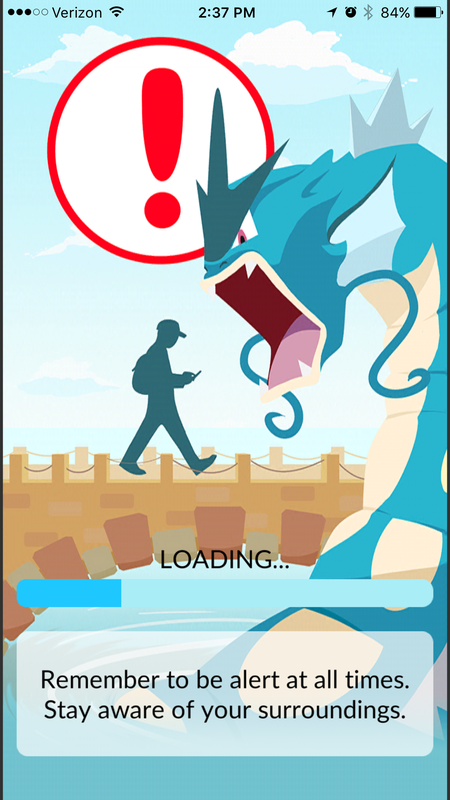 Is Pokemon Go Good For You? I admit it. I play Pokemon Go. My 14-year-old son does too. There are so many memes on Facebook and Twitter about this game. It is the most downloaded app of all time in its first week after release, according to Apple. Everyone seems to be out chasing Pikachu and Squirtle and collecting Pokeballs in their spare time. Churches are complaining because they have been established as Pokestops and Pokemon Gyms. Restaurants and video game stores are wondering how they can arrange to get a Pokestop at their location. After downloading the game almost 2 weeks ago, after dealing with server crashes and app freezes galore, I have three thoughts about the game from a health standpoint. I’ve noticed my step counts have gone up pretty significantly since I downloaded the game. On my lunch break I’m much more likely to get outside for a 20-minute walk than before Pokemon Go. Hatching eggs that I’ve collected requires me to walk 2, 5 or 10 kilometers while “incubating” the egg. There are 3 Pokestops in the square across from my family’s martial arts studio in Twinsburg, and two on the perimeter of the park. That’s 5 Pokestops within a very short walking distance. I have never seen so many teens, twentysomethings and families with young children in this park in my life. Everybody is walking around catching Pokemon and chatting and laughing with each other. There is a downside so be smart! Anything new that happens is an opportunity for someone to explore new levels of stupid. We’ve all heard about people walking off cliffs, driving into walls, and stopping their car in the middle of a busy street to catch an elusive Pokemon. Be careful where you and your children are going, and be with someone trustworthy at all times. Don’t accept requests to meet to catch Pokemon from someone you don’t know well. Bad guys are known to take advantage of new opportunities to snooker people. As long as people are careful where they go and who they are with, I think Pokemon Go is awesome and a very healthy game to play. You can’t just camp out on the treadmill and hatch your eggs, you have to actually be moving so that Google Maps can see you’re moving. Fresh air, sunshine and other people are good for you! If Pokemon Go gets you and your teenager(s) out of the house and away from the TV, I’m all for it! QUESTION: Have you downloaded the game? What has your experience been? When patients come to me for help with weight loss, one of the things we talk about is exercise. To be clear, exercise is NOT intended to burn tons of calories and tip calorie balance into the red. 90% of weight loss is related to making better food choices. That having been said, our bodies NEED exercise. Exercise increases energy, improves cardiovascular fitness, helps with sleep, decreases problems with constipation, and elevates the mood. You feel better when you exercise. Period. Frequently I hear that patients can’t exercise because their joints hurt. What do I tell people when they say they can’t exercise? What is the best exercise for joint pain? First of all, it’s important to realize that exercise DECREASES joint pain. Sitting still and being sedentary increases inflammatory markers. The more you move, the less you hurt. That being said, it’s true that jogging probably isn’t the best exercise for folks with back or knee or hip pain. What are the best options for exercise for people who have joint pain? Hands down, swimming is the best form of exercise for people with joint pain. It burns LOTS of calories, is fantastic at improving cardiovascular fitness, and strengthens all the muscles because every movement you make is resisted. Best of all, if you are obese, the water will support your joints. The water takes gravity and impact out of the equation so exercise can be relatively pain-free. If you don’t know how to swim there are plenty of adult learning courses available at the YMCA and other fitness centers that have pools. Water aerobics is also a good option if swimming laps doesn’t appeal to you. How’s your stress? If you struggle with stress AND have problems with joint pain, yoga may be the best choice for you. Flexibility (both mental and physical) are good goals to have, and yoga is a great option to help meet those goals. If you think yoga is about turning yourself into a human pretzel, think again. Yoga, practiced properly, is about becoming one with your body, loving yourself fully in the present moment, and encouraging yourself to reach just a bit farther today than you went yesterday. So what if you can’t touch your toes? You are where you are today, and that’s OK. With persistence you’ll get there. If you don’t want to get into a swimsuit, no-impact gym equipment like the elliptical treadmill and stationary bike are easy to use. Depending on which joints bother you, try out a few different pieces of equipment and see which exercises cause the least discomfort. If you’re coming up empty for ideas, a session with a personal trainer can be a good investment. Most gyms nowadays have personal trainers available for a small fee, and many of them offer a free session when you join. It doesn’t really matter what form of exercise you choose. 30 minutes of activity most days per week will decrease your joint pain and improve your cardiovascular fitness. Find something you love to do, and go do it! QUESTION: Do you have joint pain? Do you find that exercise helps? Are The Police The Bad Guys? My cousin is a police officer. He is tall and broad and in his body armor and SWAT uniform he is even bigger. He is an imposing, badass, fast-moving mountain of law and order that makes all sane people want to put up their hands and come quietly. If you saw him working you would only really see a small part of who he is though. You don’t see the man who stood in church in a tuxedo on his wedding day, held his mother and cried. After 2 cancer battles I don’t think any of them really believed she would ever see that day. You don’t see the proud pictures of his small son’s baseball games he posts, so happy his boy loves baseball just like Daddy. You don’t see how much his 3 kids love him. The American police force has a big problem. A small number of officers have abused the public trust badly enough and often enough that they have severely damaged the American people’s ability to trust that the police will do the right thing. If I may, I’d like to offer some suggestions for the police AND for the rest of us on how we might rebuild trust. The trust that goes both ways. Suggestions from a member of a formerly-revered profession that has been taking its own lumps lately due to medicine’s inability to admit mistakes, embrace quality improvement and police its own. As a member of the medical profession, I know there are bad doctors and nurses and other practitioners among our ranks. If you are a police officer, I call bull$4!+ if you try to tell me you don’t know there are bad cops out there. Lazy, sloppy, egotistical bullies that have no business tarnishing our professions. What are your unions doing about it? I don’t pretend things are perfect in the medical profession but we admit it and we’re trying to make progress. We can’t expect the public to trust us if we’re not trustWORTHY. A worker on the assembly line at a Toyota auto plant can pull a switch and stop the line if he sees something is wrong, for the safety of his coworkers and of future drivers of the cars being built. We need to empower EVERYONE in the most complicated and dangerous industries in America to be able to speak up and call attention to problems that arise. We need everyone to be part of the solutions. A continuous quality improvement mentality and zero tolerance for errors are needed. Layers of safety precautions and standardization are helpful. The public needs to SEE that we’re taking the problems in our professions seriously. A police officer shooting an unarmed person by mistake is more visible than a surgeon leaving an instrument in the abdomen or a pharmacist mixing the wrong dose of medication, but they are all avoidable tragedies. You police officers go right on being threatening and badass to the bad guys. That’s not the time to be warm and fuzzy. But for law-abiding citizens and particularly children and teens, you are the good guys, right? Attend parades and community functions in uniform and give out hugs and high-fives. I read about a local township police force that “ticketed” kids found riding their bikes with their helmets on properly with coupons for a free ice cream cone at the local scoop shop. Be friendly. Be familiar. Many police forces have active social media pages. Get busy and show your officers doing the awesome things they do. Highlight the K9 officers. Snap pics of the less glamorous things like messy desks and mounds of paperwork, funny coffee mugs and office pranks. Be human and show the human face to the people you serve. For the rest of us, we need to teach our kids that the police are the good guys and how to interact with them. As a doctor I can’t imagine how much harder my job would be if my small patients’ parents taught them if they were bad the doctor was going to give them a big shot and it would hurt A LOT. How many of you parents tell your kids if they’re bad the police will come take them to jail? If they’re in trouble how likely are they to run to find an officer? My son is fourteen and in a few years he will be driving (YIKES!!). It’s my job to teach him how to respond if he is pulled over by a police officer. I’m not going to trust that driver’s ed will teach him everything he needs to know. He knows he’s not a bad guy, but the officer doesn’t know that. It doesn’t really matter that his skin is light instead of dark. Bad guys come in all sizes and colors. With the way things are lately, I’m not surprised the police have trouble believing everyone isn’t a bad guy. Every traffic stop could be their last. I see end-of-watch notices with heartbreaking regularity on social media. Why would anyone in the world want to be a cop? The same reasons people choose to go into medicine: to serve, to help people and to make our communities better, safer, healthier places to live. I hope we can, as a society, get over our tendency to oversimplify things. This isn’t about black vs. white, cop vs. civilian, good guy vs. bad guy. Each one of us is human and every life lost is a tragedy. My cousin is a good guy. I love him a lot. The next time you’re tempted to look at the police as a faceless wall of black or blue uniforms, remember each one has a family and a story that you don’t know. They signed up for the job of protecting you from bad guys and seeking justice for victims of crime. Doctors who hurt patients need to be punished. Cops who hurt innocent people need to be punished too. Both professions need to be accountable to the public we serve. QUESTION: What are your thoughts about the current state of things between the police and the communities they serve? What can be done to improve the relationship? Ellie is an older lady I see for high blood pressure and high cholesterol. She is a sweetheart who still works in a day care. A few years ago she came to me worried that she might have to stop working because her joints were hurting her too much to keep up with her toddlers. Changing diapers, tying shoes and bending and lifting were really taking their toll. She was interested in ANYTHING that would help her feel better and able to keep doing what she loved. We talked about trying glucosamine because she had used anti-inflammatories and they bothered her stomach. She also was worried about her heart risk with NSAIDs. A significant proportion of adults use glucosamine for joint pain. One survey of over 10,000 American women reported 15% take glucosamine. What is the evidence that glucosamine is helpful for joint pain? First of all what is glucosamine? Glucosamine is a sugar-protein hybrid molecule that is used by the body to make and repair cartilage and produce fluid to lubricate joints. Tendons and ligaments which support joints also contain glucosamine. Most people are familiar with using anti-inflammatories like Aleve and ibuprofen for joint pain. They are effective for short-term relief of pain but they have significant side effects. They are hard on the GI tract and increase the risk of stomach ulcers. They block the effect of aspirin in heart disease patients (if you take aspirin for your heart do NOT take over-the-counter NSAIDs without talking to your doctor). And they do not prevent the progression of osteoarthritis, which is the slow progressive loss of cartilage in the joints. How does glucosamine compare to NSAIDs in improving joint comfort in arthritis? Studies have shown that glucosamine is as good as celecoxib (brand name Celebrex) and significantly better than placebo at improving both joint pain and joint function. As mentioned above, celecoxib (an NSAID) caused stomach upset and glucosamine did not. What else can be done to improve arthritis? In one study comparing glucosamine and exercise, both treatments significantly improved joint pain. However, exercise was also effective at improving the thickness of the cartilage cushion. So if you have arthritis, get moving! 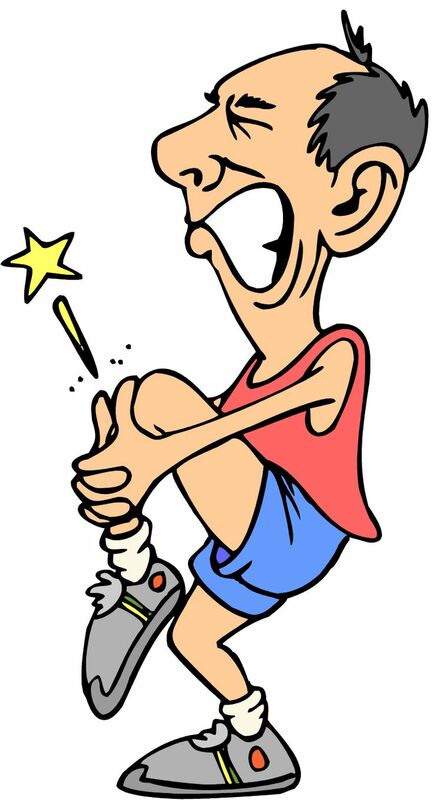 Exercise helps the joints heal in addition to improving pain. About a month after starting Shaklee’s Joint Health Complex, Ellie reported she felt significantly better, but what happened a few months later really made my day. I caught up with her to see how she was feeling and she said she’d been meaning to call me. I got it. Not only was she not hurting as much, she wasn’t AFRAID of hurting. She wasn’t limiting herself anymore out of fear of joint pain. She was just going about her life and getting done what needed done. And that’s the best result of all! Are you limiting yourself? Are you afraid to do things because of joint pain? Why not try Shaklee’s Joint Health Complex? After all, if it doesn’t help there’s no risk. As always, Shaklee’s products have a money-back guarantee. Don’t miss out on any more bike rides, long walks and games of Frisbee or bocce with your family. Click here to order Shaklee’s Joint Health Complex today! Reach out to me at drjen@jenniferwurstmd.com for more information. QUESTION: Do you suffer with joint pain? Have you found anything that helps?